THE BADDEST SHORTY TIPS ON THE PLANET. THESE HAVE THE MID-PIPE AND LARGE MUFFLER CAN BUILT BACK INTO THE SLEEK TIPS. NO P.C IS REQUIRED. MAKES EXCELLENT BACK PRESSURE FOR IN-TOWN OR HIGHWAY CRUISING, THESE ARE BECOMING VERY POPULAR FOR WEEKEND DRAG RACING DUE TO THERE PERFORMANCE. 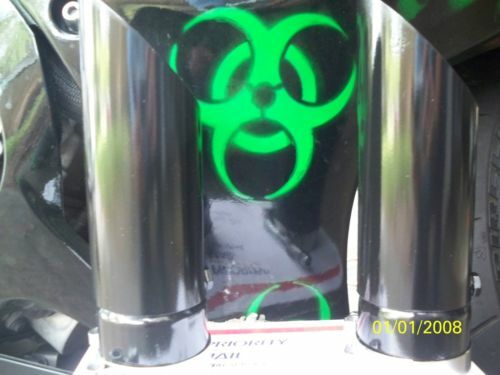 2008-2016 HAYABUSA EXHAUST TIPS. TURBO BAFFLE EXHAUST TIP EQUIPPED. STAGE 3 STAGE 3 STAGE 3 ,,,THE BADDEST SHORTY TIPS ON THE PLANET, OVER 500 SALES JUST ON EBAY. THICK METAL IS USED TO CREATE A VERY RICH, DEEP TONE. THE RACE RESONATOR MAKES EVERYTHING HAPPEN FOR THE RIDER. NO HOT FOOT WITH 11" INCHES LONG VS 9 ". THESE HAVE THE MID-PIPE AND LARGE MUFFLER CAN BUILT BACK INTO THE SLEEK TIPS, NO P.C IS REQUIRED. THICK METAL IS USED TO CREATE A VERY DEEP TONE, THESE GUARANTEED WILL NOT SOUND LIKE A TIN CAN GOING DOWN THE ROAD, THESE HAVE A VERY EXOTIC DEEP RICH TONE. THE RACE RESONATOR MAKES EVERYTHING HAPPEN FOR THE RIDER. MAKES EXCELLENT BACK PRESSURE FOR IN-TOWN AND HIGHWAY CRUISING, THESE ARE BECOMING VERY POPULAR FOR WEEKEND DRAG RACING DUE TO THERE PERFORMANCE. * Mix and Match also available for 2002-2007 and 2008-2011. Please indicate how many of what year when checking out. THE BEST SHORTY TIPS ON THE PLANET. THIS SALE IS FOR LEFT AND RIGHT SIDE EXHAUST TIPS W/ NHRA APPROVED CLAMPS. TRIED AND TRUE FOR OVER 7 YEARS NOW. THE PIRANHA TOOTH BAFFLE IS GREAT IN-TOWN AND HIGHWAY DRIVING, NO P.C REQUIRED. REAL MEAN AND DIFFERENT SOUND!! 3/4 OF THE INSIDE PIPE IS FILLED WITH DOUBLE BAFFLES, TWIN CHAMBERS, AND RACE RESONATORS. THE RACE RESONATOR IS A 5 LAYER DEEP STEEL MESH RESONATOR THAT WILL NEVER BURN OUT. BIG BOYZ EXHAUST CHEAPS OUT ON NOTHING FOR THERE CUSTOMERS, THE EXHAUST TIPS ARE MADE FROM 6 THOUSAND THICK STEEL, VS COMPETITORS USE CHEAP 3 THOUSAND THICK, WHICH SOUND LIKE A TIN CAN, USING 6 THICKNESS CREATES A MUCH DEEPER TONE GOING DOWN THE ROAD. THE PRODUCT IS TRIPLE CHROMED FOR LIFE TIME GREAT LOOK. IF WE WERE FULL THROTTLE ALL THE TIME WE WOULDN'T NEED BACK PRESSURE, CRUISING AROUND TOWN AT 1/4 THROTTLE REQUIRES GOOD BACK PRESSURE OR THE ZX-14 WILL FEEL LIKE ITS RUNNING LEAN, HIGHWAY DRIVING AT 60-80MPH REQUIRES GOOD BACK PRESSURE AGAIN. THAT'S WHY WE BUILD DOUBLE BAFFLE, TWIN CHAMBER, RACE RESONATOR. THIS MAKES EVERYTHING HAPPEN FOR THE RIDER, THE ZX-14 LOVES THE DOUBLE BAFFLE, SHOOTING THE EXHAUST THROUGH TWO CHAMBERS, IS THE NEATEST DOUBLE THROAT ROOOAAARRRRR, AND THEN THE RACE RESONATOR IS MAKING MORE BACK PRESSURE AND CALMING DOWN THE SOUND TO MORE OF WHAT A CAR WOULD RESEMBLE AS SOMETHING VERY EXOTIC SOUNDING COMING BY. 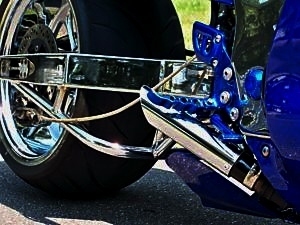 THE PIPES COME ALONG WITH NHRA APPROVED CLAMPS TO HOLD THEM DOWN. IF YOU WANT BLACK ZX-14 TIPS LEAVE A MESSAGE IN PAYPAL CHECKOUT ''NEED BLACK''. KAWASAKI ZX-14 BLACK 06-07 STAGE 3 STAGE 3 STAGE 3. YOU WANTED THE BIGGEST ROOOAARRRRRRRRR? HERE THEY ARE, LEGAL LOUD. EXTREMELY AGGRESSIVE RACE SOUND. THIS AWESOME DEAL IS FOR LEFT AND RIGHT SIDE. 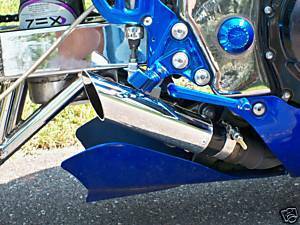 SHORTY EXHAUST TIPS THAT TUCK UP UNDER THE BIKE FOR A REAL CLEAN LOOK. PIRANHA TOOTH BAFFLE SYSTEM IS A VERY AGGRESSIVE ROAR, LEGAL IN EVERY STATE AND COUNTRY, TAKE NOTE OF THE VERY DIFFERENT THICK TONE COMPARED TO OTHER SHORTY TIPS, VERY AGGRESSIVE. 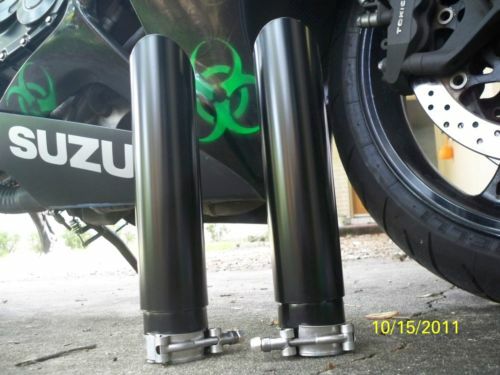 IF YOUR LOOKING FOR MORE ADVANCED TIPS , CHECK OUT MY OTHER EXHAUST TIPS FOR YOUR ZX-14 IN ''MY OTHER LISTINGS''. IF YOU WANT BLACK ZX-14 TIPS LEAVE A MESSAGE IN PAYPAL CHECKOUT '' NEED BLACK''. GUARANTEED YOU CANNOT BURN THE BAFFLE OUT, GUARANTEED FOR THE LIFE OF YOUR BIKE. http://youtu.be/DtgSEyd3UPo NOT OF ZX-14, THIS IS THE SOUND OF PIRANHA TOOTH BAFFLE. THESE WON'T BACK FIRE LIKE COMPETITORS TIPS, AGAIN DUE TO THE PIRANHA TOOTH BAFFLE. THESE WILL BE DEEPER AND THICKER SOUND THAN ANY TIPS ON THE PLANET.